The year is flying by. Each one seems to be faster than the last. The baseball season has reached it's All-Star festivities and there has been its share of surprises. 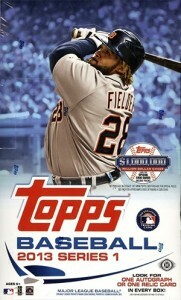 The same can be said of the first half of the 2013 Topps baseball card releases. As with most of my articles, I plan to focus more on the case busting angle of the products thus far. This does not mean I have not enjoyed products that have not fared as well as in the past. I still put together the Museum Collection Framed Autograph set for myself. 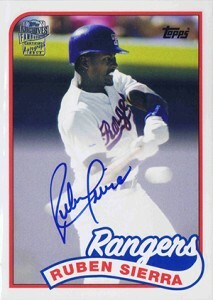 I have also added to my collection of Topps Heritage retired player on-card autographs, among others. My experiences as a case breaker does not always translate the same as my personal opinion of a product, but I do feel the case breaking aspect sheds some light on overall product values. Sure, any one case or box can yield 'once-in-a-lifetime' results or be one you wish you never touched. Multi-case breaks can also yield different information based on tougher pulls or tougher sets completed so use my reviews keeping these factors in mind as always. Back in January, I wrote an article previewing the first half of 2013. I pointed out that while of course I was excited to start the calendar year of Topps releases, I was a bit more skeptical than the past few years. Factors included rehashed content and designs, lack of early rookie power, new autograph deals, and content changes. As far as case breaking is considered, this has been my lowest results as far as ROI since 2009. But we were all spoiled with Topps loading content, adding star power in their autograph lineups by signing many retired greats, and the fact that it was a prospector's dream with major players such as Strasburg, Trout, Harper and others. Something had to give and this hobby, like any market or industry, has its cycles too. But the best news is that even during down times, we are still collectors at heart and can keep collecting. That is one of the greatest things about the hobby and why it has lasted through ups and downs. As for the products, I have categorized the 11 Topps Baseball releases from strictly my case-breaking view as Surprising, As Expected, or Disappointing. Overall this year has played out as I had expected with overall results being down and some traditional products such as base Topps having less overall value. Yet there were a couple of nice surprises. In fact, every product has nice surprises as far as collecting or content is concerned. Many products saw increases in sealed wax prices by release, yet when compared to releases over the past few years they were also somewhat disappointing. I want to be clear, Topps does not owe breakers anything. It is not what they are in business for. As a collector, none of these factors have stopped me from collecting but may have an impact on what and how much I bust. For the first time in a long time I heard of case breakers losing money due to dropping set prices, tougher-than-expected insert sets for master set sales, lack of SSP cards, a soft 'hit' checklist, and lack of firepower within the code program. There were still some nice surprises that added value. For example, for those that participated in the wrapper redemption program, it was the best for base Topps ever. The added silver framed parallels were received well. Also, after the initial shock of there being tougher insert sets, I really liked them. The designs, card stock, and value were all solid. So what started as a shocker or disappointment actually turned into a surprise for those that did not pre-sale so much. The base design is awesome, yet the lack of SSP cards (which I know are very tough pulls) or even a super-popular SP card (which are not as tough such as the Rally Squirrel) took away from nice added value for multi-case breakers. The bigger hits are so limited now that even multi-case breakers rarely saw one let alone the box or pack breaker. The code program has also had its share of issues, and while fun and at times rewarding, as far as reselling value, codes that used to sell for $2-$4 each over the past few years can now be found in lots of 100 for $10. While it is hard to knock the flagship release, it is in the disappointing category because it was the one sure thing each year and has the largest collecting and breaking base there is. I am looking forward to see what changes Topps may have in store for 2014. One for my personal wish list is hoping the Legends return as variation short prints. Topps can do no wrong with the online exclusives (except for those that get shut out from them, but they are limited for a reason). I did not order much as I was not sold on this release. I have tried to like Turkey Red in the past but just could not do it. The sticker autos were a turn-off for me (although I am not one that is against sticker autographs in some cases). Nonetheless, the product has been very popular with sealed boxes now at three or four times higher than the initial Topps pre-sale pricing. I thought this would be in the "As Expected" category as it has been so consistent. Yet, it has to be in the surprising category for me as it moved from my fifth or sixth best ROI product each of the past five years all the way to #1. The basics of the product are always the same and that helps breakers and collectors both for consistency. But this year there were surprises like the return of Refractor hot boxes (like in 2011) and the highly sought after SSP Washington Senators variations that added tremendous return to my break. The average box often does not yield much to the average collector with one hit (often a current player relic) and one Chrome parallel but over multiple cases, it yields some nice sets and autographs. This is one of my favorite releases of the year. I love the on-card autographs, designs, and mini cards. I also love that it is one of the lesser produced releases. Even though I do not have a very strong demand for sets from my customers, I still look forward to it. Unfortunately, this set continues to have value removed and tinkered with. Once again, it confused set builders due to the various variations and the mini set being different from the base set, as far as the variations were concerned. I want this product to succeed, yet I feel as though it could be on the way out if anything better comes along. I hope it does not. This year there were no mini inserts and also no mini back variations (gone are the blue back Straight Cut and the red back Gypsy Queen). This not only removed lots of value even for those busting a box, but made the regular mini cards less valued since they fell much more often and were easier to acquire. Thus breakers were hurt from both sides. Also, the autograph and relic checklist was considerably weak compared to the previous two offerings as far as retired players go. This has to be the biggest disappointment of the year, especially when one considers the cost. The case prices started dropping the day of release, which has been rare for Topps baseball releases over the past year. With other tinkering to the serial-numbered colored minis and the coin relic parallels, this product needs help and consistency to find a larger audience. I am hoping it does if it is still around in 2014. Here is another release that saw case prices fall at release. Three things that went against it immediately were the release date being pushed back by two months, the fact that it came out just one week after Gypsy Queen (which had several of the same on-card autograph offerings), and the similarity it had with 2012. One of the new additions are the Best of the Best autographs that appeared to be the top hitters, pitchers, base runners, and fielder. Yet this one turned out to be just one player in each of the four categories and they were each numbered to 5. Even the cool new framed mini autographs were a let down, as the checklist was only five cards deep and serial numbered to 25. I loved both ideas and I pre-ordered more than usual, but both were very long shots. I'm not sure why the checklists were so small. If they return next year, I hope they will be larger. Perhaps the biggest thing that hurt this product from a breaking standpoint was the fact that parallels no longer fell one per pack. Instead they were falling one or two per box. Those created huge value in the past, especially as a hit-focused product. Those parallels could save your box or case. For the past couple years, Bowman has been the release to pre-order cases and, in many cases, hold a couple weeks and sell sealed. This year, those that did were disappointed early on, although they still were on the good side. We did not see case prices jump like they have in the past couple years. But after a month or so, Yasiel Puig and his two (tough to pull) insert cards stopped the downward trend. But as far as breaking it, many breakers knew the value would not be what it had been in the past with Strasburg and Harper. There was Byron Buxton, who has performed very well on the secondary market. It should also be noted that direct cost on jumbo cases went up more than ten percent. So overall, this product was still strong, just not huge. This was a surprise in 2012. But an increased direct cost and little to no changes from last year meant no similar surprises. The other issue with the products not seeing many changes are the fact that many have the same signers from last year. I realize they are under contract but it would be nice to see a better mix as, year-to-year, the values naturally decrease if the same card or something similar is made. That was the case here with the Framed Autographs. The base and parallel cards are nice but do not have the draw of the stunning Tribute base and parallels. It's tough to break this and feel good about it unless you're very lucky. It is a shame, because some of the cards are amazing and I thoroughly enjoy collecting them as singles. Do not mistake the "as expected" as being good or bad. In this case, it was not great. 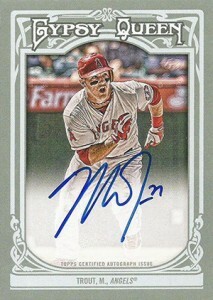 2011 Topps Lineage was cool but, other than the inserts, was not that well received and tanked fast. Archives came along in 2012 and looked to be headed down the same path but with late additions of Bryce Harper and Yu Darvish, 2012 Topps Archives turned out to be a stable product. And even then, ROI was not that strong. Plus Topps got the base set right with classic designs with the card backs too. This year there was added items later on again, but they did not have the same feel. Sure the Heavy Metal autographs are nice, but other than Axl Rose, they were not super strong in terms of added value. There were not as many additions this year and without the excitement of the Harper and Darvish cards and autographs from 2012, this cool set slid back some. The base set and insert sets remain popular, as do the Fan Favorite autographs, but all can be had at very affordable prices. This year, the autographs were all semi-star guys. Last year at least had some stronger names such as the before-mentioned Harper and Darvish, plus Mays, Aaron, Koufax, Mattingly, and Griffey Jr. Hopefully next year Topps is able to put out a stronger autograph checklist while keeping the base set, insert sets, and additional content just as collectible as 2012 and 2013. See Series 1 notes plus add a much weaker autograph lineup for the Chasing History set. Then take away the wrapper redemption program, and add in the fact that the Million Dollar Chase codes continue to slide in terms of value. Ouch! Series 2 is usually quite weak, especially with factory sets just around the corner and much of the newness of the baseball year worn off. The checklists are typically weaker as well. This year lacked a late-addition hot rookie such as Strasburg or Harper. In the past, Topps looked to add value with Series 2 with items like Red Hot Rookies. Those have been missed and this year would have been a great year for them to return. The cards look great in hand and the condition of the cards was stunning when compared to past releases done on similar card stock. The direct cost on the product for 40 autographs per case was very reasonable and allowed much room for increase. And increase it did. Of course, Yaseil Puig had much to do with that, but there are many reasons to like this release. Many folks were not too high on it at first, especially since most prospectors desire Chrome and graded Chrome. And while some feel there are a bit too many Bowman releases each year, this is one I hope to see stay around for awhile (and stay affordable). Every year, as I have stressed before, it is important to look over product details (at least the ones we do have prior to release) and not only see what has been added but what has changed or been removed. It is easy to get caught up in what is new and fresh. Card companies all do a good job marketing their products, but it is our responsibility to do our homework too. 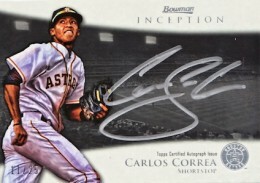 I recap Topps releases because it is what I know best. While I have busted both Panini and Leaf releases this year, I do not bust near them in the same quantity or frequency. Personally, I prefer Topps, as do my customers. That is not speaking ill toward any other manufacturers as there were surprises from them as well this year. 2012 Panini National Treasures Baseball is a great example. There are many positive things that the others are doing and when I have the time, I bust their products as well. If nothing else they are creating more competition. I say this to encourage changing it up. I expected this year to be a down year for me in terms of busting cases and the return on investment. I started doing group breaks. I busted some other products such as Topps Star Wars Jedi Legacy and Garbage Pail Kids BNS2. I am always looking for new things when my calendar has open time, but most Topps releases take up a 17- to 21-day window so it is not always easy. Right now, there are so many great releases in many areas. Like I said Panini and Leaf are improving in the baseball market. While basketball has been quite strong this year for Panini as was football last year for Topps, Panini, and Leaf. Hockey looks to be huge in 2013-14 with the double-rookie class. The entertainment card market continues to be the fastest grower in the trading card market. There are so many solid releases that have ROI much higher than even the best baseball releases while requiring far less work. Plus, there is not the same releases all year long, so it changes things up for you and your customers. That is one reason we are seeing such growth in this area and with new manufacturers coming up strong. There have been many great releases the past 18 months with several more on the horizon that get me excited. Generally, the second half of the year is quite weak for baseball with the season winding down and the products having the same rookies and same autographs for the most part. Plus the type of products that are released are different. Meaning there aren't the set-building types like Heritage, Archives, and Gypsy Queen, but rather the products are either more high-end focused such as Triple Threads, Tier One, Five Star. These are always hit and miss. There are also the rookie and prospect-focused sets like Bowman Platinum, Bowman Chrome, Bowman Draft, Topps Chrome, and even Topps Update. This year with Yasiel Puig cards promised in the upcoming releases, we should see very strong demand and increases for sealed wax. I am still not sold on case breaking as even with Strasburg and Harper it was tougher in the latter part of the year to break even overall. Puig cards will be hot and command a premium but he will likely often be a tougher pull and, possibly, a redemption in regards to his autographs. Another thing to remember here is that even if case breaking is impacted positively in the case of Puig (and it is), there will be more people ordering products and breaking them. This will supersaturate the market for the more common items making their value not quite as strong on the secondary market in terms of case ripping. Plus, one rookie should not make or break a product. It is easy to hide lack of content or value when hot rookies drive releases, and often some will think a product is outstanding when it is weak just because they see the high prices of hot rookies or the very rare numbered hits. This is not to say there won't be some strong releases to close out 2013. on the contrary. There will be and Puig's cards will add to that intrigue. This is more just a word of caution from experience to think a product through before deciding to rip. In many cases, from a collector standpoint, unless building master sets, it makes more sense to stick with buying singles, even if to hold and resell at a later time. Look around, ask questions, study, and do what you enjoy. If you can not afford to bust cases and perhaps lose a chunk of change, then I would advise against it, especially right now. But there are other areas that might be worth checking into, even if at the box or single-case level. Most importantly, have fun. This hobby has turned into a lot about money, and mainly out of necessity, as it has become much more expensive to collect compared to 15 or 20 years ago. Yet we are able to collect so many more cool items like relics and autographs. Sure, we can't keep all that we open and have to be choosier in what we collect, but if you are busting cases at the aim of making money, by the end of year you have to realize that in the end it may not come out in your favor. That is why I say study and bust wisely. Still, a balance can be found. Use this information however you can. If nothing else, it is a brief recap that sheds a little light on the changes made or not made and the value that the average box or case provides.